Today’s heavyweight showdown between former light heavyweight and cruiserweight world champion Tomasz “Goral” Adamek (50-4, 30 KOs) of Poland and Eric “Drummer Boy” Molina (24-3, 18 KOs) Raymondville, Texas in Kraków at the Kraków Arena for the IBF Intercontinental Heavyweight Title will be distributed in North America by Integrated Sports Media for live viewing at 2 pm ET/11 am PT on both cable and satellite pay-per-view. In addition to the live pay-per-view telecast in Poland as part of Polsat’s Boxing Night series, US residents will be able to purchase the fight for pay-per-view on via iN Demand, DIRECTV, DISH Network, and Vubiquity in the United States, as well as Rogers TV and SaskTel in Canada, for a suggested retail price of only $29.95. Please contact your local cable or dish provider for more information. This event is presented by Polsat, Main Events and Don King Productions. 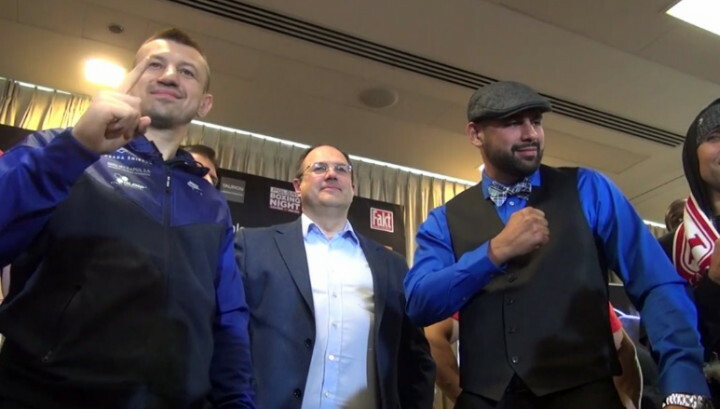 The pay-per-view telecast will also include several key undercard bouts: a 10-round cruiserweight fight between Mateusz Masternak vs. Eric Fields and a 10-round cruiserweight fight between Michael Cieslak vs. Francisco Palacios. KRAKOW, POLAND (April 1, 2016) – The official weigh in for tomorrow’s “The Final Call” pay-per-view event was held today and all of the fighters made weight (see below). Integrated Sports Media will distribute the card in North America for live viewing on cable, satellite and Internet pay-per-view via iN Demand, DIRECTV, DISH Network, and Vubiquity in the United States, as well as Rogers TV, Bell TV, Shaw PPV and SaskTel in Canada, for a suggested retail price of only $29.95. Please contact your local cable or satellite provider for more information. In addition, the fight is available in North America for purchase on-line at www.GFL.tv and www.Eversport.TV (Polish commentary only), and via the FITE.TV app for both Android and iOS. Four bouts are scheduled to air tomorrow, starting at 2:00 p.m. ET / 11:00 a.m. PT, live from Tauron Arena in Krakow, Poland. Two other fights may be shown, time permitting. “The Final Call” is promoted in Poland by Polsat, as part of the Polsat Boxing Night series, in addition to Main Events and Don King Productions. TOMASZ ADAMEK (50-4, 30 KOs), Jersey City, New Jersey, USA 223.5 lbs. ERIC MOLINA (24-3, 18 KOs), Raymondville, Texas, USA 231.7 lbs. MICHAL CIESLAK (11-0, 7 KOs), Radom, Poland 199.5 lbs. FRANCISCO PALACIOS (23-3, 14 KOs), Bayamon, Puerto Rico 198.4 lbs. ANDRZEJ WAWRZYK (31-1, 17 KOs), Krakow, Poland 236.7 lbs. MARCIN REKOWSKI (17-2, 14 KOs), Kaliska Koscierskie, Poland 227.7 lbs. MATEUSZ MASTERNAK (36-4, 26 KOs), Wroclaw, Poland 199 lbs. ERIC FIELDS (24-3, 16 KOs), Ardmore, Oklahoma, USA 198.4 lbs. RAFAEL JACKIEWICZ (48-14-2, 22 KOs), Minsk Mazowiecki, Poland 146.8 lbs. MICHAL SYROWATKA (13-1, 4 KOs), Elk, Poland 146.6 lbs. EWA BRODNICKA (10-0. 2 KOs), Champion, Warsaw, Poland 134.7 lbs. ANITA TORTI (9-5, 3 KOs), Challenger, Milan, Italy 134 lbs. The final press conference for this Saturday’s “The Final Call” pay-per-view event, starting at 2:00 p.m. ET / 11:00 a.m. PT, was held today. Below are fighters’ quotes. Four are scheduled to air live on PPV from Tauron Arena in Krakow, Poland. Two other fights may be shown, time permitting.